From 7 January Carroll / Fletcher Onscreen will be showing Sounds from Beneath, the second part of Mikhail Karikis’s Work Quartet. The following section is the first part of a text Mikhail wrote for Voice Studies: Critical Approaches to Process, Performance and Experience (Routledge, 2015), which reflects upon the origin, making and sonic structure of the film. “What are the sounds specific to this community and how are they remembered? Are official language and ceremony adequate memory keepers of the miners, their achievements, resistance and culture?” Mikhail Karikis. The project Sounds from Beneath emerged as an artistic response to an invitation by an arts festival in Kent in South East England to create a site-specific work. The piece orchestrates an aural reunion of a group of former coal miners on a disused colliery, and discovers a mode of voicing that responds to their professional specificity, charged with the political and historical dimensions of their community and culture. Rich in its industrial history from the time when coal played a primary role in British life, fuelling domestic fires and industrial furnaces, and stimulating the socio-political and cultural life of the country – from unions to choirs – the Kentish landscape is marked by the radical urban, social and economic changes that have taken place in Britain since the mid 1980s. Lush green hills are punctuated by barren and disused collieries, vast shopping malls, former mining villages and their alienated regenerated versions. Kent was a place of intense coal mining activity, where local and migrant miners and their families lived, worked, and partook in the cultural and political life that characterized the mining community. Since the dismantling of the coalmining industry in England in the ‘80s, the Kentish coalmines have stood silent. Despite the striking muteness of the empty pits, what is still audible, through the spoken memories of old ex-miners, is the generational passage of song and story in the vivid language of the miners, which has kept account of their history and tradition, giving voice where official narratives and histories have denied it. Traces of such sounds and memories can still be heard in some village pubs and mining welfare clubs and choirs where former colliers socialise and sing. But what sounds are specific to this community and how are they to be remembered? Are official language and ceremony adequate memory keepers of the miners, their achievements, resistance and culture? Defeated by the state, the coal miners did not receive official praise, nor were they nationally ceremonially mourned as they fell in combat with the state’s interests. Both official praise (through civic speech), and ceremonial mourning (through religious or formal musical rituals) are vocal acts designed to introduce the fallen into the realms of glory and historical memory. They also have a role to play in managing public grief and supressing expressions of resentment. In the case of fallen soldiers, who are sent by the state itself to the battlefield, ceremonies and speeches manage trauma and control rage, which may threaten public order. As vocal acts, they are essentially control strategies of public expressions of grief, giving articulate and restrained shape to sorrow. Civic speeches and formal rituals are directed to the nation and are experienced communally, overwhelming individual lament in its manifestation of despair, trauma and fury at the cause of harm, and its potential to lead to reciprocal violence and subsequently shake the stability of the state and challenge its leadership. As Gail Holst-Warhaft observes in her study of traditional ritual laments practiced by women in Greece and across many parts of the world, lamenting has often been supressed and antagonized by official authorities due to its open expression of personal anger at the cause of death, and its refusal to acquiesce with the state’s demand for men to die in its defence. Ethnographic film projects such as Cecila Mangini’s ‘Stendali’ indicate that as vocal acts, laments operate outside official language; they inhabit the marginal space of dialect and idiom, and include extra-lingual vocal gestures such as shouts, sighs, cries and sobs. Laments present personal narratives that summarise the dead relative’s life and the emotional impact of his/her loss. In contrast, official national mourning is a form that finds expression in articulate vocal acts which assert the state’s authority over death, remember its fallen as citizens, and ultimately supress and tame inarticulate pain and anger by channelling them into feelings of pride and nationalism. While lament narratives tie the bodies and personal memories of dead relatives to a physical location and give a sense of subjective and site-specific concreteness to the otherwise abstract nothingness of death, national mourning aims to provide an abstract raison d’être for death in defence of the nation. It insists that posthumous glory outweighs private grief, and inspires new generations to fight for a state that glorifies its fallen in a uniform comradeship beyond physical defeat. Women’s laments are infused by a logic of care that privileges birth and makes an enemy of the cause of death. They voice the preservative role of love and oppose the military destruction of life, thus presenting a de-militarised conception of human life and the body, which transcends civic and military function. While the above suggests a conflict of interests inherent in any attempt to make civic speech a memory keeper of the miners’ culture and achievements, it also presents the female practice of lamenting as a model of voicing loss, which exists outside official language and shakes its authority. Therefore, if there is to be a mode of vocal production that expresses the narrative of disempowerment of the miners, it must gain the subversive dynamics and challenging power of women’s laments, while expressing the miners’ cultural specificity. Returning to the issue of identifying the sounds that are specific to the mining community, my field research for Sounds from Beneath revealed some stark facts. In my exploration of the region of Kent, I visited local pubs and mining welfare clubs where old miners gather to socialise. 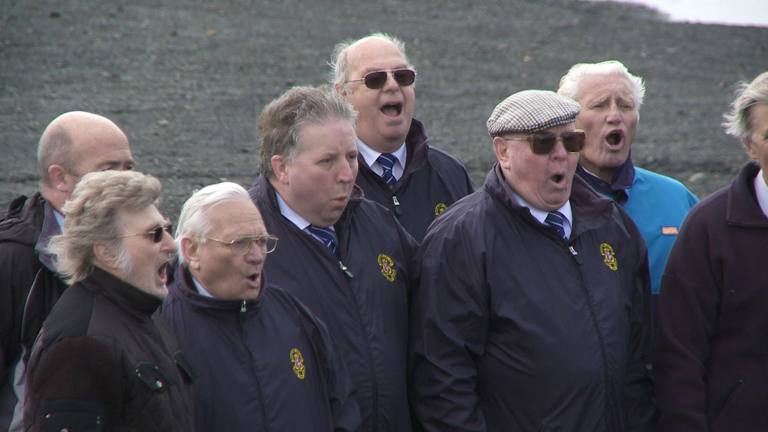 In 2010, at the back of Snowdown Colliery Welfare Club, I discovered a choir of elderly former miners, who regularly rehearse in a large barrel-shaped dance-hall a repertoire that ranges from miners’ anthems to Broadway songs – the former singing of past strength and the miner’s hardships, the latter offering light entertainment. This vast gap in content and sentiment in the choir’s repertoire was a poignant signifier of the alienation and abrupt interruption of the miners’ choral tradition, which was entwined with their workplace and the union. Sung outside the work context and recounting past narratives, the choir’s mining songs are heard like dusty historical records temporally disconnected from the present. Beyond the choir’s mining songs however, the work of the collier was itself sonorous, as was the working mine with its powerful soundscape of excavating the earth. From the rumble of subterranean explosions to the scratching of shovels, each part of the coal mining process was sonically distinct, making sound practice the by-product of the miner’s labour. The soundscape of the mine formed a profession-specific noise composition, which followed the rhythms of the working day. Its noise connected the miners’ labour with the site of their work, and produced an aural signifier of the mining community, identity and profession. Although mining sounds have stopped resounding in the Kentish collieries, they still exist in the aural memories of former miners. In my search for sounds specific to the their community, I collaborated with Snowdown Colliery Choir and asked them to recall and vocalise the sounds they used to hear when they worked in the mines. In a subsequent film entitled Sounds from Beneath, the choir sing noises that evoke the coalmine standing on the disused Tillmanstone Colliery near Dover. Mechanical clangs, whirring engines, wailing alarms, subterranean blasts, scratching, hissing and whistling vocalised by the men reanimate the empty pits. Detached from their original source and emanating from the aging bodies of the miners on the colliery, these noises re-establish a connection between the labour of mining and the body, site and memory, humans and machines. Their song presents the men with a reason to come together again and transforms the desolate site into an amphitheatre of communal remembering forming a subjective and site-specific record of former activity and community. But these are not sounds as they used to resound across the mine in the past; they are aural recollections as they exist in the embodied present, marked by the texture of the half-remembered and of time passing. The miners unearth a suppressed memory of loss, and compose a re-collective lament outside the confines of language, both resisting social inaudibility and resonating beyond the silence of vanished industrial architectures.